So what’s important about this coming Super Bowl Sunday? Who wins? The points spread? What food you should order for the half-time spread? Not in a million. If you, like so many Americans around the world, will be spending Sunday afternoon and evening at the home of family or friends, the most important thing is gifting the right flowers to your hostess. What better way to thank her for opening her home to you than to present her with a delightful centerpiece that will remind her of how thoughtful and considerate you are for several days after the final whistle blows. You do want to flatter and compliment, without sending the wrong message, don’t you? The Indianapolis Colts are playing in blue this Super Bowl, and to follow through the color scheme, start with some blue delphiniums. They’re lovely tall flowers, and give some height to a centerpiece arrangement, around which you shorter flowers can fill in. Delphiniums are available in a range of blues, from light, sky blue through to a rich, dark and deep blue. Pick the freshest and sweetest scented. Hyacinths have a delightful perfume, rich and heady, and though they’re usually a fall flower you should be able to find them in January without too much trouble. 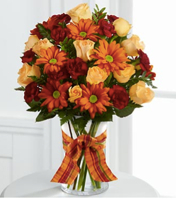 They’re also fairly tall, and so can be used by your arranger to give a layered look to the arrangement. Alternatively, consider blue irises for a stunning and elegant arrangement. Whichever you choose, consider using misty-limonium to fill in around the main flowers; it will really give the arrangement a more full appearance, maintaining the blue theme. Don’t take blue flowers to a hostess that’s supporting the New Orleans Saints, though; not if you want to be welcomed back next year! The good news is that many more flowers are available in white than in blue, so you’ve got a little more flexibility here. Roses, lilies, chrysanthemums or tulips all lend an elegant touch to any room color scheme. Choose a variety of open blooms as well as tight buds, so the shapes compliment each other and make the fragrance last. Fill in with bellflowers or baby’s breath, retaining some greener for contrast, and it’s bound to be a hit. One word of advice – no busy hostess will thank you if she has to rummage in her cupboards for a vase, so if you can afford it, find something with clean and classy lines. Finish up with a contrasting ribbon for an elegant flourish, and be prepared for your hostess to be wowed when you present her with the arrangement on Sunday. Good luck, and may the best team win!